The vote is unanimous, we would be nothing without our mothers. In raising gurgling toddlers to become responsible adults, our mothers teach us everything we need to know. They go above and beyond to facilitate a learning environment for us; constantly supporting us in every decision we make, even if they aren’t entirely convinced. Mommy dearest makes sacrifices for us that we could never fathom and loves us more than we can ever imagine. After all, unconditional love is part of the deal! So, it’s no shocker that we love our real mommies just a tad bit more (okay, a lot more!) than the sometimes overbearing, and other times anxious matriarch portrayed in pop culture! We all know we have the best mommy in the world; how could the on-screen mom possibly come even close in comparison? 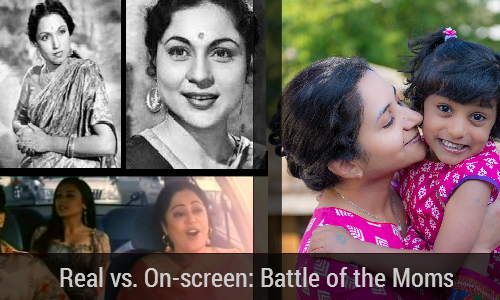 From her bizarre habits to her over-the-top or dysfunctional mothering, the reel life mom is worlds apart from the real life mom. This Mother’s Day, we’ve identified 10 ways our moms are nothing like the ones on-screen! Reel moms wake up their children with the voice of an angel and the touch of gossamer. On the other hand, we may never be in need of an alarm clock when our moms are around, but that she always wakes her kids up with a loving caress and a kiss on the forehead is a myth that requires busting! The daily drill in most homes is such – lots of screechy ‘Utho Beta!’ followed by ‘Get up now, you’re going to be late!’ which escalates to berating us for adding to mommy’s morning woes, finally coming to rest at the ever effective turning off of the fan/AC and pulling the comforter off of us! NOT exactly the lovey dovey wake up call you were hoping for, but efficient nonetheless. While moms on-screen are always saving their offspring from Papa ki daant and zaalim zamaana, our moms do quite a bit of daantna themselves! If it means admonishing us for doing something wrong in an attempt to make us better human beings, she’s all for the yelling-until-the-neighbours-know-what-we’ve-done-wrong. On a serious note, we couldn’t be more grateful that she doesn’t always sweep our follies under the proverbial sofa! No, our mothers do not wake up with rosy cheeks and perfectly shaded eyelids. In fact, our mothers were the pioneers of the messy bun trend, sporting it every morning while they tried to get a million things done before sending us kids off to school and dressing up for work. And while we’re at it, let’s be grateful that our moms don’t wear their best sarees and all the gold they have stashed away in a locker, just to go to the sabzi mandi! Yikes, that would be real embarrassing! Give us our fresh faced, messy but lovely natural mommies any day! Lunches and dinners aren’t always a fancy affair in our households like we see on TV. Really, who cooks food magazine-worthy aloo parathas and gajar ka halwa enough to feed an army on a daily basis, when recipes for dal chawal and aloo gobi are much easier? Our mothers deserve a break from the kitchen too, you know! No matter what, the food mommy darling cooks is always perfectly seasoned with her special ingredient – love! While the on-screen Ma reacts to situations involving her kids with the gentleness of a flower, the calm of the night, and the wisdom of a saint, our mothers freak out, lose it and sometime crack under pressure. They also don’t always have an enriching speech prepared for every time we’re at crossroads or in trouble. Like us, they too learn from circumstances and mistakes, with only our best interests to guide them through the crossroads. The perfect reminder that we are all only human, and we’re not expected to always hold it together. The above point being stated, our mothers don’t howl and cry every time we fall and scrape a knee. How many times have you watched the spectacle where the mother bawls her eyes out while beating her chest as the neighbourhood looks on, on TV? Far too many times! And yeah, that’s nowhere close to reality! In real life, moms, although extremely concerned, contain their worry and handle the situation like pros, their poker faces giving strength and reassurance to their kids too! Sssshhh…we’re not telling the kids how you weep behind closed doors to make up for it later! We’ve heard the phrase, ‘Tu mere aankhon ka tara hai!’ probably a gazillion times; just not from our mothers! While reel moms are too busy latching on to their kids’ every word and pampering them beyond repair, real moms reprimand us and get us to pull our socks up, all with an intention to make us strong enough to face the world. Whatever affection they feel for us is hidden cleverly behind passive aggressive taunts, wisecracks and stern lectures. It’s no secret that our moms have an intuitive understanding of our needs no matter how old we are. However, that doesn’t mean she knows when your flight has landed and stares at the door until you walk in a la Jaya Bachchan in Kabhi Khushi Kabhi Gham! Now, that would be downright creepy! If you’re sitting in an exam hall and thinking your mum is at home praying constantly, you must also think unicorns exist and that Honey Singh deserves a Grammy! Contrary to what the entertainment industry portrays, our mothers don’t spend all day offering prayers for good marks, couldn’t care less about nazar utarna and certainly don’t do havans and pujas if our stars are not perfectly aligned! Instead, they encourage us to jiyo khul ke and make our own destiny! We feel for the Rajs and Meeras on TV who wish to do something hatke, but whose dreams are always met with the discouraging ‘Log kya kahenge?’ and ‘Khandaan ki naak chahte ho tum?’ In saying this, we are glad our moms push us to fulfill our dreams. Dreams that may seem larger than life and out of reach, but are totally achievable when our mommies have our backs! That includes buffering the sly enquiries about our unconventional jobs and our single status so that we can focus on being the amazing people that they raised us to be! We love the moms on-screen who entertain us and make our lives colourful; but, needless to say, we are beyond grateful for our wonderful mothers. Beautiful, wise, loving and caring, they are perfect in every way. Our real life moms may not be Mother India, but they’re our very own mothers, and that’s more than we could ever ask for! Dear Moms, on the occasion of Mother’s Day all we want to say is, thank you. Not just for refraining from being dramatic and overly flamboyant, but also for being our biggest support system, guide and strength. Thank you for making us the people we are! To our superheroes we say, Happy Mother’s Day! Parenting Mistakes – Are You Making Them Too?